All Full Tilt Mustang II-style suspension systems are designed and engineered to allow precise wheel alignment for best ride and handling. Following any suspension modifications, your alignment needs will depend on several factors, including any difference in tire size between front and rear (i.e. are you running larger tires in the rear?) Here's a summary of the adjustments used in front-wheel alignment. Caster is the forward or backward tilt of the spindle (measured in degrees). Negative caster is a forward tilt. Positive caster is a backward tilt from vertical. Camber is the inward or outward tilt of the top of the wheel (measured in degrees). Negative camber is an inward tilt, away from vertical. Positive camber is an outward tilt from vertical. Bumpsteer is that aggravating tendency that some suspensions have of making a car dart and wander all over the road as it rolls over bumps and dips. 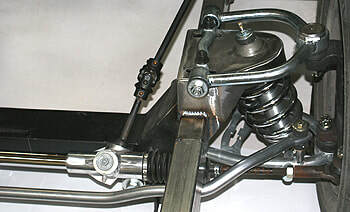 To avoid the dread Bumpsteer, the tie-rod's arc of movement during suspension travel must match the lower control arm.s arc of movement. That is exactly how Full Tilt's Mustang II IFS systems are engineered. 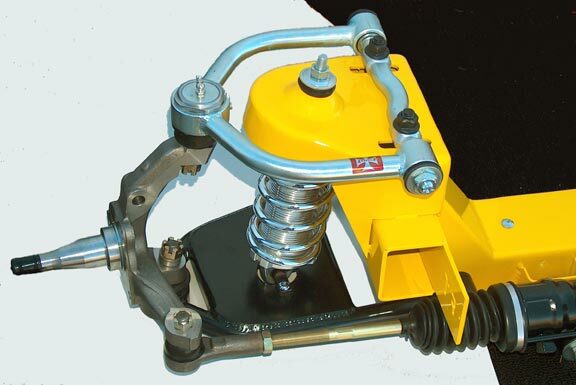 Anti-Dive is an important feature built into all Full Tilt Mustang II-style IFS suspension systems. The design mounts the front of the upper control arms higher than the rear to cancel out the tendency of front-end dive under hard braking. It's easy to figure out what 5-lug wheel size you need or what 5-lug axle or wheel you're looking at by using the measuring trick shown at left. 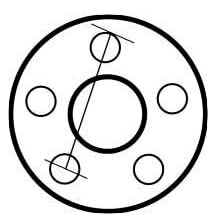 Just measure from the outer edge of one stud or hole to the center of the second one away as shown. Measure carefully. The two most common patterns are 5 on 4 1/2" (most Ford and Mopar) and 5 on 4 3/4" (most GM/Chevy).